Dr. Jorge Elías Alva Hurtado was born in 1948 in Lima, Peru. Having obtained his bachelor’s degree in Civil Engineering from the National University of Engineering (Peru) in 1970, he studied at the Massachusetts Institute of Technology MIT (USA) obtaining a Master of Science and Civil Engineering degree. He obtained his PhD degree at the University of Massachusetts, Amherst (USA). He works as a consulting engineer for national and foreign companies and organizations in public and private large-scale projects in Peru and other countries, having executed more than 3000 projects. 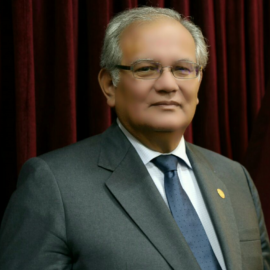 Since 2015, Dr. Alva is President of the National University of Engineering UNI (Peru) and continues to work as a full professor at the Civil Engineering School of UNI (Department of Soil Mechanics). He is also chairman of the Peruvian Engineers Association (CIP) since 2016 and is a member of the Pan-American Academy of Engineering. He has an excellent background in civil engineering, specializing in geotechnical and seismic risk and was part of important national and foreign missions to assess damage caused by earthquakes in Peru and other American countries. Dr. Alva has held important positions, such as board Member of the Geophysical Institute of Peru; Dean of the Faculty of Civil Engineering, National University of Engineering (UNI); Director of the Japan-Peru Center for Earthquake Engineering Research and Disaster Mitigation; Peruvian representative at the Regional Center of Seismology for South America, and Head of the Postgraduate Faculty, National University of Engineering (UNI). He has also been a teacher at important public and private universities in Peru. He joined WFEO as a member of CDRM in 2016. Since December 2017, the Peruvian Engineers Association (CIP) serves as the host of the Committee on Disaster Risk Management from 2017 to 2021. Dr Jorge Alva is the Chairman of this Committee.